Your Son has been growing and developing into a man of confidence, strength and intelligence. 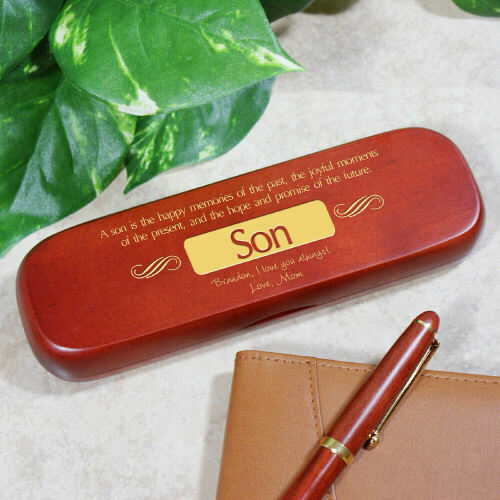 Present your son with a thoughtful and handsome Personalized Son Pen Set to express your joy and love for the man he is becoming each and every day. of the present, and the hope and promise of the future. It is a perfect gift for my son to use at his desk in his office. Additional Details Personalized Keepsakes for Him from GiftsForYouNow.com provide a great way to spend some quality time with your Dad, Son, Grandpa, Uncle or Friend any day of the year. Let GiftsForYouNow.com create a one-of-a-kind Keepsake he will be proud to display.